For those without comedic tastes, the so-called experts at Wikipedia have an article about Halloween 4: The Return of Michael Myers. 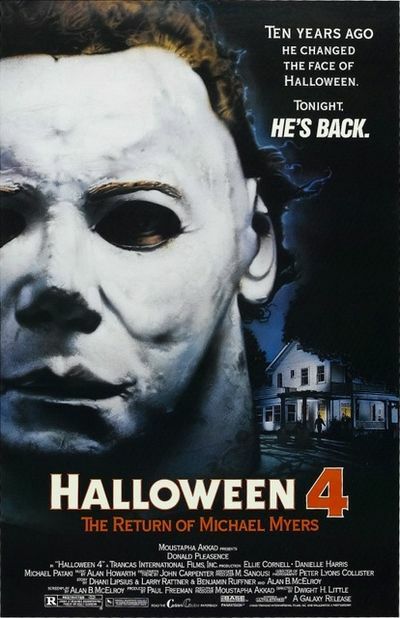 Halloween 4: The Return of Michael Myers is the 1988 sequel to Halloween and is the fourth entry in the Halloween Series of horror-slasher films. It is the first film in the series to not directly involve John Carpenter or Debra Hill, who had sold their rights to Moustapha Akkad and independent studio Trancas International Films. However, before the sale, Carpenter and Halloween II & III novelization writer Dennis Etchison came up with the idea of Michael Myers being a ghost/supernatural entity that haunted Haddonfield, similar to Carpenter's 1980 film, The Fog. However, Akkad felt that Michael Myers should be a physical being. Basically, he wanted to turn Myers into Jason. In this sequel, serial killer and mass murderer Michael Myers (Played by George P. Wilbur) -- having been absent from the previous Halloween III: Season of the Witch storyline -- awakens from a decade-long coma to terrorize Haddonfield once again. Donald Pleasence, the only actor to do so, reprises his role as Dr. Sam Loomis. Halloween I and II star Jamie Lee Curtis was unable to reprise her role of Laurie Strode because of the film's lower budget. This lead writer Alan McElroy to create a new victim for Michael, his seven-or-eight-year-old niece Jamie (Danielle Harris). Laurie was killed off in a bizarre gardening accident. Spoiler warning: The following text may contain major spoilers, precede with caution. Hey, buddy, why haven't you seen this movie already? You probably haven't seen a movie since Star Wars... in 1977! On the morning of October 30, 1988, Michael Myers (George P. Wilbur), having been comatose for the past decade, is being transferred back to Smith's Grove-Warren County Sanitarium for some reason. He overhears that Laurie had died some time ago and that she has a daughter still living in Haddonfield. This causes him to jolt awake and kill the paramedics. Dr. Sam Loomis (Donald Pleasence) gets word of this and renews his hunt for his psychotic patient. By chance, he finds Michael at a run-down diner adorned in pictures of Abraham Lincoln. Loomis recognizes the coveralls of the man standing behind the counter, despite the fact that the man is still wearing hospital bandages instead of a mask. "Michael?" Loomis urges him not to go to Haddonfield. "If you want another victim, take me. But please leave those people at peace." Michael takes off like a cheetah before Loomis can fire his gun, and heads to Haddonfield for one more scare, Loomis in host pursuit. Loomis tries to hitchhike. A convertible full of jocks and hot chicks initially stops for him before revving up. After that episode, a religious wacko named Jackson P. Sayer (Carmen Filpi) arrives in a beat-up truck. Upon arriving in Haddonfield, Loomis demands to see Sheriff Brackett, only to learn that he retired in 1981 and moved to Florida. Sheriff Meeker (Beau Starr) reluctantly comes to his aid, recognizing Loomis immediately. They begrudgingly agree to team up to stop Michael's latest anniversary massacre. Laurie's daughter, Jamie (Danielle Harris) was adopted by the Carruthers family. Her foster sister is Rachel (Ellie Cornell). When the babysitter cancels at the last minute, Rachel is stuck babysitting Jamie on Halloween, even though she already has a date planned with her boyfriend, Brady (Sasha Jenson). When Rachel and Lindsey (who is supposed to be Lindsey Wallace from the original Halloween) pick up Jamie from school and take her to the store to pick out a costume, Rachel tells Brady the news about their date. Jamie picks out a clown costume, blissfully unaware of its eerie similarity to Michael's at age six. Meanwhile, Michael conveniently picks up a new mask, the cheapest and whitest mask he could find. It basically looks like a generic version of his old mask. When Rachel and Jamie go trick or treating and arrive at Sheriff Meeker's house, his daughter, Kelly (Kathleen Kinmont), greets them. Suddenly, Brady descends the stairs and notices Rachel. Don't you just love threesomes? Nothing much else happens in the movie, but Loomis does deliver great lines. Roger Ebert and Richard Roeper give their verdict. The film was met with positive reviews from the horror press, but the mainstream film critics weren't so kind. Roger Ebert, a huge fan of the original, gave Halloween 4 two fingers up, calling it the biggest crapfest since Ernest Goes to See "Howard the Duck II: Howard Goes to See Dragnet" -- an abysmal movie-within-a-movie-within-a-movie. The film did far better commercially than it did critically. Halloween 4 made $44 Million at the box office, $32 Million in its opening weekend, a blockbuster for a horror film. It has since made 15 times its box office gross in home video and DVD sales.